Unfortunately, it has reached a point where we once again need to point out that radios are IN CHARACTER means of communication. That means you can not react to OOC actions such as players being kicked, killed because it shows up on the kill list, or generally comment on OOC situations on the radio. Radios are only meant to communicate and organize with your friends, factions or contacts. We have the global OOC function if we believe you can handle talking across the server. In addition to that function we added groups, and later teams for you to organize across factions and unofficials. You can use them to talk about anything you want - it's up to you. We will begin cracking down on this on a much larger scale from tonight as it's something all staff members, and many faction leaders have had issues with in the past. Mixing is a general issue on the server, and this is the first step we will take to limit that problem. We're all guilty, and we've all done it. Let's look forward now and actually get better. Initially we will issue kicks or 60 minutes mute on players who abuse the function, repeated offenses may result in /warnings or worse punishments. It's been a while but we're still alive; gamemode updates have been put on the server. Fighting styles are no longer reserved for premium members; now anyone can get any fighting style, including the the one with very high damage, knee-head. Every character now has a fitness level which can be increased in the gym. In every gym activity your fitness level increases. Every paytime, your fitness level decreases by 10. Premium members only lose 5 fitness level per paytime. You can select your desired fighting style (/gym fightstyle) but in order to keep it you must keep your fitness level high enough; so go to the gym regularly. 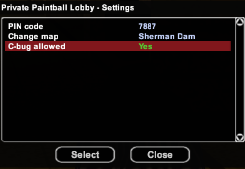 Paintball lobby creators may now change the map immediately and allow players in the lobby to use c-bug, for those who prefer that. - Disabled commands while dead: /bk, /fbk, /em, /cuff, /tie, /r and unable to use the local IC chat. - Players can now use "/team leave" to leave their team. If the tier 0 member leaves, the team will be deleted. - The turf take over warning message will now show the attacking alliance name. If the faction is not in an alliance, it will display the faction name. - Added fitness level & a gym. The higher your fitness level, the better fighting styles you can use. Go to the gym and use /gym! Fitness level decreases by -10 every hour. (-5 for premium) You can use the treadmill in the gym and 1v1 boxing fight against other players while increasing your fitness level. - Warnings have been reset. Warnings will now always last 6 months (180 days). Warnings will automatically be deducted after 6 months, however the admin log entry will remain. - The shaking screen effect will now be canceled if you die. Any feedback regarding these additions and changes are welcome. More updates to follow.